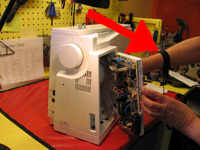 What Goes Into a Tune-Up? 1. Disassembling the covers in preparation for the tune-up. Notice the red mat that the machine is resting on and the wrist band that our tech is wearing. 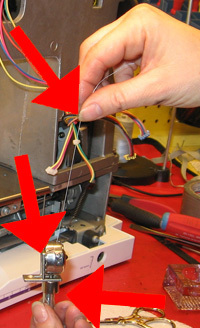 The mat and wrist band ground the workbench and technician to dissipate any latent static electricity which could damage the machine's circuit boards while they are separated from the machine. 2. Typical carbon debris accumulation inside the cover. 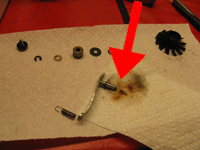 The carbon debris is removed during the tune-up to avoid contaminating fresh lubrication which will be applied inside of the machine. 3. 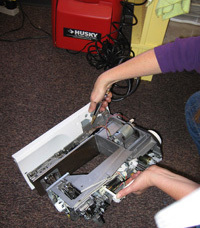 One of many mechanical parts being removed in preparation for cleaning. 4. 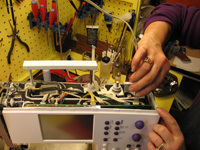 Initial cleaning of the machine skeleton with compressed air. 5. 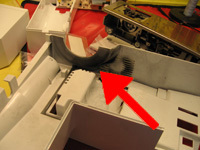 Manual removal of stubborn threads, lint and fuzz which could not be dislodged during the compressed air cleaning. 6. The bobbin hook system has been disassembled for cleaning. Those little black dots aren't debris from the machine. They're actually teeny-tiny screws! 7. Look at the burnt oil cleaned from this integral pulley system. 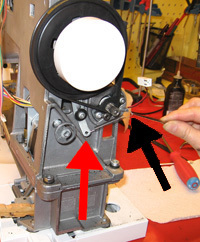 Virtually every movement in the machine is dependent upon the function of this pulley. Should the pulley become too soiled or the oil become excessively burned, the entire machine could seize, causing catastrophic damage. 8. In case it isn't obvious yet, let us point out that our expertise does not extend to photography! You'll have to trust us when we say that this is a photo of our tech re-tensioning the belts after the freshly cleaned and lubricated pulley has been reinstalled. 9. 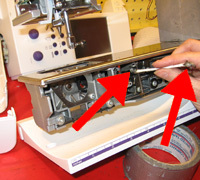 The upper thread path is inspected, cleaned of stray threads, and the tension disks are recalibrated. 10. 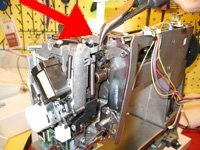 Old, soiled grease and oil are removed from the mechanical parts in the front and back of the machine. Notice the old, black grease on the end of the cleaning tool. 11. 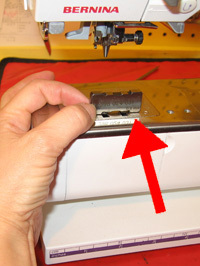 Fresh, BERNINA grease is reapplied to the appropriate areas of the machine. 12. Light-weight oil is applied to other mechanical parts. Thread Play techs know exactly what to apply where. 13. 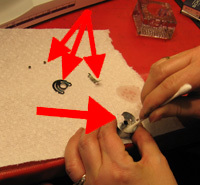 The bobbin case is disassembled, inspected and thoroughly cleaned. 14. 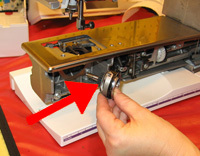 Our tech is calibrating the tension on the cleaned and reassembled bobbin case with a BERNINA counterweight. 15. 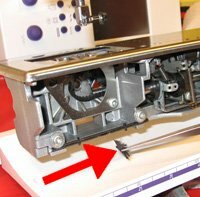 The bobbin hook system has been reinstalled and the machine has been re-timed. 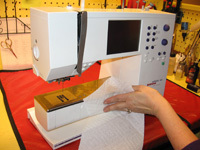 The tech is performing a bobbin system calibration with special BERNINA gauges to ensure the best quality stitch formation. 16. 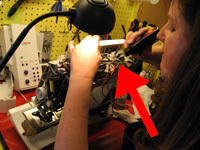 Cables are reconnected to the circuit boards when the machine is put back together. 17. 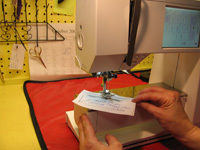 The feed dogs are checked with a special BERNINA gauge to ensure that they are at the proper height to efficiently move the fabric through the machine. 18. The machine housing is thoroughly cleaned. 19. 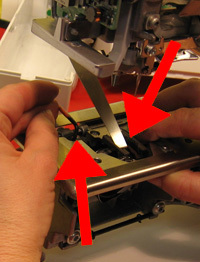 A final test-sew ensures that the machine is sewing at its peak.